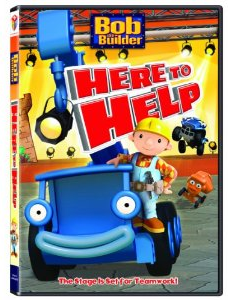 Bob the Builder: Here to Help DVD is a fun collection of episodes about teamwork and adventure. My kids love watching Bob and his friends getting things done, and they are great examples of being helpful. Bob the Builder and his Can-Do crew are Here to Help in this action packed collection as they get the job done and share tales of teamwork from the building yard. Scoop and Lofty learn that they can accomplish a lot with a little help from their friends; Scrambler is in for a big surprise when he accidently frightens Lofty and must dig deep to repair his friend's confidence' Scoop needs a truckload of teamwork to save Wendy's birthday celebration and Scratch learns there's no one star of the show as everyone must work together to save Fixham's History Day celebration. Dizzy spins some chaos on the lighthouse ramp and must rely on teamwork - and a newfound talent for wheelies - to fix the mess. Join Bob and his machine team as they lend helping hands, scoops, cranes, shovels and more to build lasting friendships in these Can-Do tales of teamwork and fun! Bob The Builder: Here to Help is $9.49 at Amazon and targets 2-5 year old. Runtime is 55 minutes and there is a game plus a couple of music videos in the bonus features. Check out Bob the Builder on Facebook to stay connected. Giveaway will end Tuesday March 13th at Midnight MST. Winner will be chosen by Random.org. I was given the above dvd to review from Lionsgate and HIT Entertainment. No other compensation was received. All opinions are my own. If you have previously won the above DVD you are not eligible. All information gathered for the giveaway will be discarded when over. Your privacy is important.